Congratulations to Adsec: In recognition of 6 years of partnership! 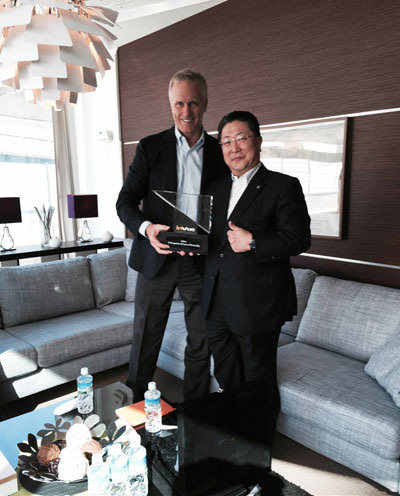 In November, Adsec in Japan received an “In Recognition of 6 Years of Partnership” award from Jim Sankey, CEO and President of InVue Security Products. Adsec, led by Harry Koizumi, has been a valuable, successful partner of InVue’s for six years. Adsec introduced retail display security PODs to the Japanese market and has consistently dominated sales to the top three Telco chains for the last four years. Thanks to Adsec’s sales and marketing efforts, InVue has a strong leadership position in the retail display security market in Japan. InVue and Adsec are currently working together on a new phase of market development, which begins implementation this month. Adsec is not new to InVue awards. They won the inaugural “APAC InVue Partner Innovation” Award in 2013, due to their creative merchandising and design initiatives using InVue products.